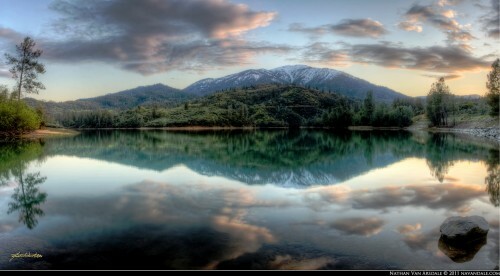 Whiskeytown Lake, located about 8 miles east of Redding, is another large man-made reservoir of Shasta County. It is a rich breeding ground for bald eagles that nest on the lake’s shores and inhabit a number of other wildlife such as black bears, mountain lions, deer, turtle, Canadian Geese and more. During the summer months, Whiskeytown Lake is packed with locals seeking refuge in its cool crisp water. Other available recreation, besides swimming, includes fishing, camping, boating & water skiing. Personal water crafts such as Jet-skis have been banned from this lake; however that is still an option on Shasta Lake. At Whiskeytown Lake, fishermen are in for a treat with an assortment of rainbow & brown trout, largemouth, smallmouth & spotted bass & kokanee salmon. There are also many hiking trails throughout Whiskeytown Unit, some of which lead to beautiful waterfalls. Visit our Activities Page for more information on possible hiking trails. Whiskeytown Lake was formed as part of the Central Valley Water Project and was dedicated by President John F. Kennedy in 1963. Whiskeytown Lake’s 241,100 acres was formed by Whiskey town Dam, an earth-fill embankment dam that was completed in 1963. Though there are a number of creeks flowing into Whiskeytown Lake, the majority of its water comes from the Trinity River. *Information taken from an article “History of Whiskeytown Lake” by ©2012 Forever Resorts. Cited from http://www.whiskeytownmarinas.com/whiskeytown-history. Retrieved 2012-05-17.